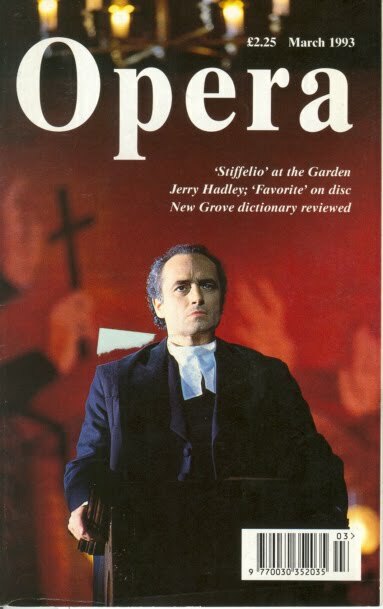 Earlier this summer, Mockingbird recommended an 1850 Verdi opera entitled Stiffelio. If you managed to catch this on DVD, you were no doubt confronted as I was with a theme as old as the Gospel, a theme that is the Gospel: the theme of our brokenness and God’s unmerited favor reaching out to us in that brokenness in order to rescue us. Stiffelio deals with the infidelity of a pastor’s wife, the pastor’s subsequent discovery of it, and the way in which forgiveness unfolds, which comes in a way that could only be from God. The most crushing scene takes place in the church’s cemetery, illuminated only by the moon and a warm swath of light from within the church, a light which is streaming through a single stained glass window. On the window is a simple image of the Cross. As the scene unfolds, for me it brought to mind a sermon title from Paul Zahl, his Easter 2009 sermon entitled “Cards from Another World”, which was a Bob Dylan reference. It’s a line from the song “Series of Dreams”, in which he says, The cards are no good that your holding, unless they’re from another world. Now, what do I mean by bringing up this Dylan lyric? Well, the cards that we as humankind are holding, in the absence of an intervention from outside, literally from outside of this world, ie., Christ–these cards are no good. The hand of cards that we’re holding as members of fallen humanity will only and always lead us to trouble in a never-ending cycle of hurt. My crime is written on every tomb, at every murmur of the breeze I hear the voice of judgment. (Looking down) This is my mother’s grave. She was so pure…and I? Mother, help me in my sorrow! (She throws herself down on her mother’s tomb.) Look down from the throne of heaven on your daughter’s sorrow. Offer the Lord these penitent tears. Weep for me with the Saints. Then God will not deny me his forgiveness. So these are the cards that Lina is holding: shame, guilt, fear of impending judgment–a whole slew of negative emotions come to mind. Those are just a few. Do you not hear a terrible cry arise from the dead? The hour of your punishment has sounded! Comfort? (Turning in prayer to God) Anger and hellfire consumes me. You would calm my heart with an icy hand. Let the blood cease to boil and my failing virtue gain strength. Leave me! My heart is destroyed! Do not punish me in anger, Lord. Or I shall melt like mist in the sun. Not of forgiveness! The faithless woman! I curse her! The elderly priest, still serving as a very real and present voice of God, says simply, “From the Cross, Christ pardoned all men.” And the scene closes with Stiffelio collapsing on the ground before the window and it’s image of the Cross. Now, that’s some pretty heavy stuff. And a story like this never changes from generation to generation. What was true in Verdi’s day is true today. Humanity in its brokenness and sinfulness constantly gets things wrong and makes a mess out of life. But that wasn’t God’s final answer according to Verdi’s opera and that’s not God’s final answer for us, either. The final scene of Stiffelio is what Tolkien would have called a eucatastrophe, which is a literary term he coined to refer to a favorable outcome that is completely unexpected. Incidentally, Tolkien thought of the resurrection of Jesus Christ as the “ultimate eucatastrophe”. Yes, forgiven. God has spoken it! And Lina’s response is what I think our response will look like when we are some day face to face with the Lord. This is what it will look like when we are finally and completely rescued from our brokenness. We see glimpses of it now, but some day it will be complete and permanent. Lina rises, cries out in joyous disbelief, lifts her hands to the heavens praising God, then clutches her chest in full comprehension of what has just been said; her Bible drops from her trembling hands as she falls prostrate on the floor before the pulpit, praising God for his mercy. I also happen to like the way this clergyman is garbed. What a treasure, that Verdi created an opera on this theme.